A research group led by Dr. Ryoko Nakata and Dr. Takane Hori at Research and Development (R &D) Center for Earthquake and Tsunami (CEAT), and Dr. Tatsu Kuwatani at Department of Solid Earth Geochemistry (DSEG), the Japan Agency for Marine-Earth Science and Technology (JAMSTEC: Asahiko Taira, President) estimated spatial distribution of the long-term slow slip events (L-SSEs) beneath the Bungo channel in southwest Japan. By using fused regularization, a type of sparse modelling suitable for detecting discontinuous changes in the model parameters, the team’s study found that the largest slip abruptly becomes zero at the down-dip limit of the seismogenic zone, and is immediately reduced to half at the up-dip limit of the deep low-frequency tremors, and becomes zero near its down-dip limit. Such correspondences imply that some thresholds exist in the generation processes for both tremors and SSEs. It suggests that geodetic data inversion with sparse modelling can detect such abrupt changes in the slip distribution. Sparse modelling is not yet widely applied to areas of geodesy and seismology. Here, the scientists, with an interdisciplinary collaboration accelerated by data-driven science exploring universal data-analytical methodology, presented that the spares modelling is useful for analysis of data of crustal movements. It is expected to contribute to systematic understanding of slip mechanisms with different temporal characteristics. This work was partly supported by JSPS KAKENHI (Grant Numbers JP16H01564, 25120005, 25120009, and 25120011) for the “Initiative for High-Dimensional Data-Driven Science through Deepening of Sparse Modeling,”JSPS KAKENHI (Grant Numbers JP16K17798, 16K16108, 25280090, and 15K20864) and JST PRESTO (Grant Number JPMJPR1676). The above results were published in Scientific Reports on July 21, 2017 (JST). Figure 1. 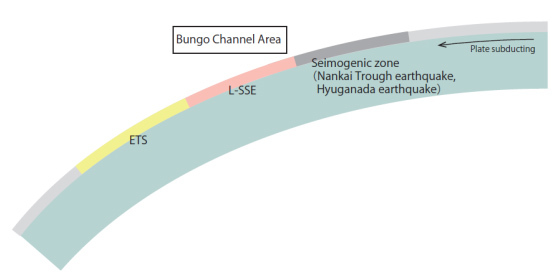 Various events occurred beneath the Bungo channel area. Figure 2. (a) Estimated slip distribution in the dip direction for the 2010 event. Black dots indicate GEONET stations. (b) Slip distribution along line AB. Red represent the 2010 event. Gray line represents the 2010 event estimated by smoothed inversion [Yoshioka et al., 2015]. Figure 3. 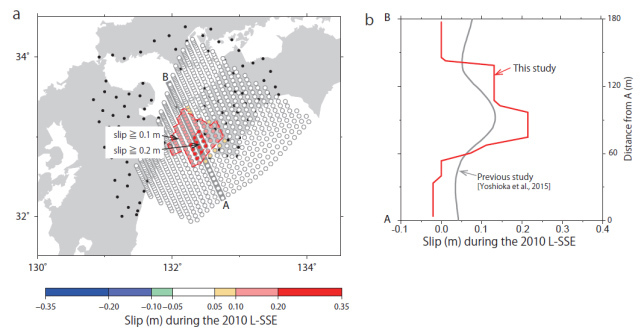 Comparison of L-SSE slip distribution in 2010 (red polygon with the solid and dashed lines) estimated in this study and spatial distribution based on finidngs from other seismological studies. Black dashed contours show the temperature (250–550 °C) on the Philippine Sea plate. Figure 4. Blue, green, and red lines represent slip distributions of the 1997, 2003, and 2010 L-SSEs along line AB (as in Figure 2b). 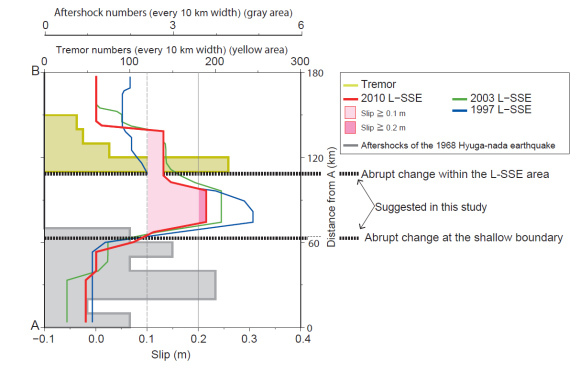 Yellow line shows the total tremor numbers in 10-km increments along line AB. 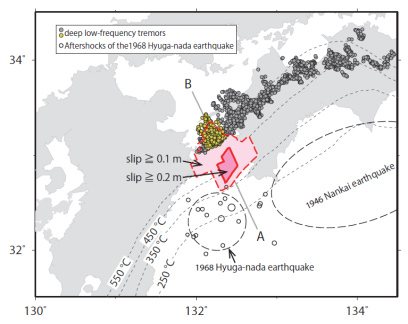 Gray line shows the total number of aftershocks for the 1968 Hyuga-nada earthquake in 10-km increments along line AB.